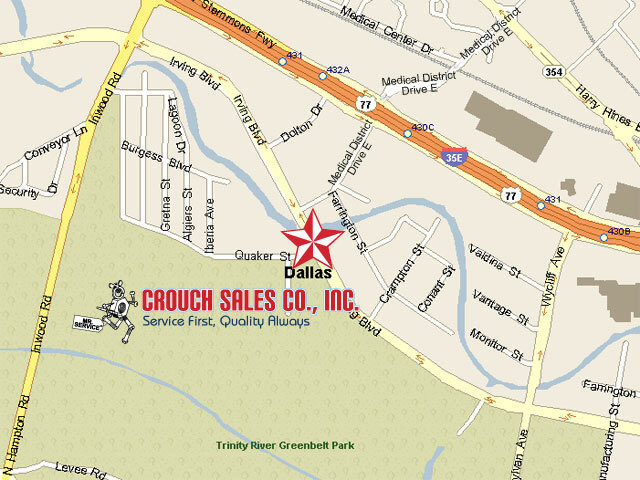 The Dallas fasteners warehouse and sales counter for Crouch Sales is located near downtown Dallas just off I-35/Stemmons Freeway at the corner of Medical District Drive and Irving Boulevard near the design district on the western side of Stemmons Freeway in between Inwood Rd. and Wycliff Ave. Medical District Drive was previously named MOTOR STREET. PLEASE NOTE the name change of MOTOR STREET to MEDICAL DISTRICT DRIVE when looking for the exit off of 1-35/Stemmons Frwy. Go west on MEDICAL DISTRICT DRIVE toward Oak Cliff to Irving Blvd and turn left to immediately find Crouch Sales on the left.